Salts, salts, salts! They’re not just for culinary purposes. Salts are known for many healing properties for inside the body and out. Benefits of salt have been worshiped for thousands of years. Hippocrates noticed that fishermen’s damaged hands avoided infection after exposure to salt water. Who knew? Here at Wake, we use a variety of salts in our foot soaks because of those same healing properties. We offer soaks with just Epsom salts and we also offer a unique blend of pink Himalayan salt, Dead Sea salt, and Epsom salt. All of these salts have amazing functions that are beneficial for your skin as you soak away in luxury. 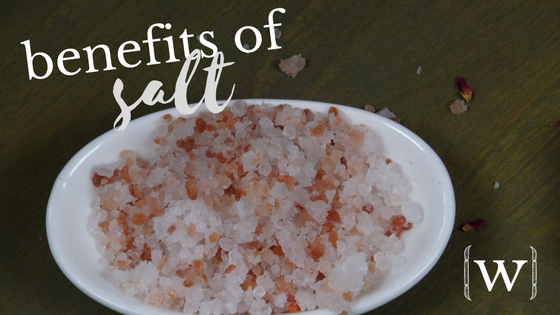 Below you will find out more about each salt and the benefits of salt. Himalayan crystal salt comes from salt mines 5,000 feet deep below the Himalayan Mountain Range. It is 99% pure because the salts experience a high amount of pressure in the mines. Pink Himalayan salt’s color as well as its color variations are because of the high mineral content. Himalayan crystal salt can be pink, white, or red in color. Since the skin is our largest organ of the body, it will be able to absorb anything you put on it. Pink Himalayan salt contains over 84 minerals–like calcium, magnesium, potassium, copper and iron. Those minerals will absorb right into the body through the skin. We are exposed to toxins and chemicals everyday through the food we eat, air we breath, and water we drink. Using pink salt in a bath is an excellent way to draw out those chemicals from the skin. A warm bath infused with Himalayan pink salt is also great for relaxing cramped muscles and reducing inflammation. The magnesium and some other trace minerals found in the salt absorb through the skin to help heal damaged muscle and other soft tissues. Minerals in pink salt also work to fortify bones, skin, and connective tissues that may contribute to body soreness. Salt has antibacterial and antiseptic properties allowing healing to take place in conditions such as eczema, acne, or psoriasis. It also helps improve circulation. Your skin will not wrinkle in a salted bath because the salt allows the skin to hold hydration. Epsom salt is not actually salt. It is a high mineral compound consisting of magnesium and sulfate. It has no sodium chloride (the actual salt.) Epsom salt is magnesium that is bonded to sulfur and oxygen. It is known to soften skin, detoxify the body, relax sore muscles, and reduces stress. This particular salt has many healing properties from the minerals contained in the salts. It helps to strengthen cell membranes, cleanses pores and helps cells retain nourishment. It is also detoxifying. Bathing in a dead sea salt solution helps in keeping the skin moisturized and revitalized. Dead Sea salt baths can also help eliminate the roughness and inflammation on the skin’s surface because of the high magnesium content. It also helps in the detoxification of the body by flushing out toxins from the pores, while also aiding in improving blood circulation.